Dubai, UAE, July 12, 2018: Al Maya Distribution, UAE an ISO 22000:2005 & HACCP certified FMCG Distribution Company proudly announcing the official launch of Pinar Water from Pinar Su Turkey. This auspicious event was inaugurated by H.E. Mr. Can Dizdar, Ambassador, Embassy of Turkey, Abu Dhabi. And H.E Mr. Erdem Ozan, Consul General, Consulate General of Turkey, Dubai. 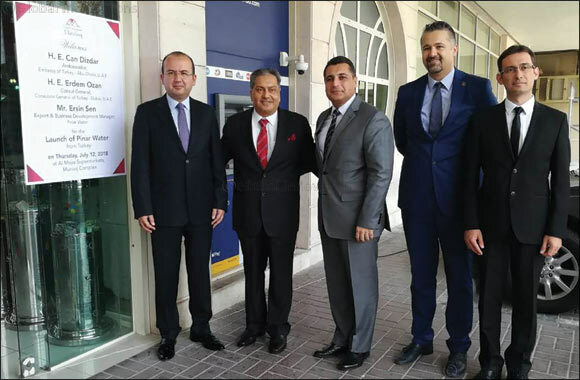 In the presence of Mr. Ersin Sen, Export and Business Development Manager, Pınar Water, Dubai and Mr. Hasan Onal, Commercial Attach�, Consulate General of Turkey, Dubai. Pınar Su (Pınar Waters), a member of Yasar Group, one of the respected institutions in Turkey introduced packaged bottled mineral water to Turkish consumers in the year 1984. With state-of-the-art production facilities of international standards, fully automated filling process is carried out by means of Class 100 Isolator and Clean Room technology without disrupting the water’s natural structure or changing its mineral balance. Pınar Su maintains its leading position on being the first packaged water brand in Turkey with TSE certificate. Pinar Mineral Water has been patronized by consumers across the globe. Today Al Maya has a well-structured distribution network across UAE, Oman, Kuwait, Bahrain & UK, representing renowned multinational & regional brands such as Kraft Heinz, Cadbury’s Biscuits, Oronamin C, Pocari Sweat, Ice Cool, Koka, Bundaberg, MTR, Society, Govardhan, Kohinoor Foods, Pillsbury, Aeroplane, RRO, Bikano, Horlicks, American Kitchen, Sante, Hydro coco, UFC, Acorsa, Minara, Kawan, KG, Silver Swan, Renuka, Hartbeat, Vochelle, Jungle Oats, Beautiful Denmark, Polenghi, Fulfil, Skippy etc. As stated by Mr. Kamal Vachani (Group Director – Al Maya Group), our vision is to be one of the most admired FMCG distribution companies in the GCC region.